Perhaps best known as a source of tequila, agaves are a flowering succulent common throughout the American Southwest and Northern Mexico. If allowed to live their entire lifecycle, some produce a large flowering stalk that’s perfect for making didgeridoos. Their thickness, tapered shape, and resonance produce explosive and incredible sounds. The flower stalk of most agaves turns into wood after approximately one-year baking in the desert sun. 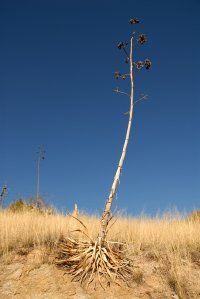 Some of the larger, stronger agaves can survive multiple years through the harsh wind, rain, heat, and cold of the desert. It’s these unique plants that comprise my Old Soul Collection available on this site. I take conservation seriously—only harvesting agaves who’ve already dropped their seeds in order to ensure the health and continuation of the ecosystem. Collecting the best stalks is extremely rigorous. It requires hiking up and down mountains through long expanses of desert, passing up many imperfect stalks along the way. For my didges with bells, I pull leaf-after-leaf from the base of the plant in order to expose the bulbous base (the part that would have produced tequila) and create an elegant shape. Once collected, each stalk is individually analyzed and cut to the length best suited for use as a didgeridoo. I carefully bore out the softish interior—leaving the hard resonant wooden exterior intact—then sand the inner walls to make sure the entire pulpy center is removed. Although time-consuming and labor-intense, I strongly believe that this method creates a vastly superior didge. Boring out the interior instead of splitting the didge preserves the strength, resonant integrity, and natural curvatures that make agave didges unique. Next, I carve and attach a wooden mouthpiece using various domestic and exotic tonewoods. This allows the musician closer contact with the wood, eliminating the need for beeswax, and resulting in a more sanitary instrument that requires minimal maintenance. I’ve researched and experimented with a wide variety of tonewoods to find those that add resonance to the didge without reducing the agave’s tremendous natural qualities. The tonewoods you’ll find on my didges are a symbiotic balance between artistic enhancement and performance. I then seal the inside with an extremely strong epoxy resin. This waterproofs the inside of the didge so that it won’t crack and is necessary to increase the resonance of the agave. After sealing the inside, I strip the thin bark from the outside of the stalk and sand the entire exterior with a very fine grit to bring out its natural character. As I’m using older stalks, most of the didges come with holes from insects and natural cosmetic imperfections from their time in the desert. I strengthen the areas around these small holes to reinforce the stalk’s integrity and then carve them out to inlay crushed stones, turquoise, malachite, lapis, and other gems and minerals. Finally, I finish the exterior again with an epoxy resin. Some didgeridoo makers use two exterior coats, which I feel results in a less explosive, less resonant instrument with a somewhat dull sound profile. I use one layer, creating a beautiful glassy finish that highlights the natural characteristics of the wood and retains sound quality. Each line of didgeridoos that I produce is the result of preserving the natural state of the agave to retain its embedded characteristics. Whether it is the elegant shape of the Bell Collection, or the organic cosmetic imperfections that make the Old Soul Collection weathered and rustic, each piece is a window into my heritage and the desert southwest. There are easier ways to make a didgeridoo. But the painstaking process that I use during harvesting, boring, creating the mouthpiece, and sealing results in a unique sound quality I’m extremely proud of. These are instruments; first and foremost, they must play well and offer incredible sound. They’re also art, which is why I take the time to preserve and enhance their natural beauty. I’m certain that you’ll find the quality—both musically and artistically—to be among the finest available anywhere.